Two years ago, Camilla made the most amazing wreath featuring a paper cocktail umbrellas. You should see it. It’s awesome. After seeing her wreath, I made a mental note to pick up umbrellas at the party store so I could make my own, but for whatever reason, paper umbrellas and I never crossed paths. Until this weekend. And they weren’t yellow and pink – they were flag umbrellas. Did you hear that people? 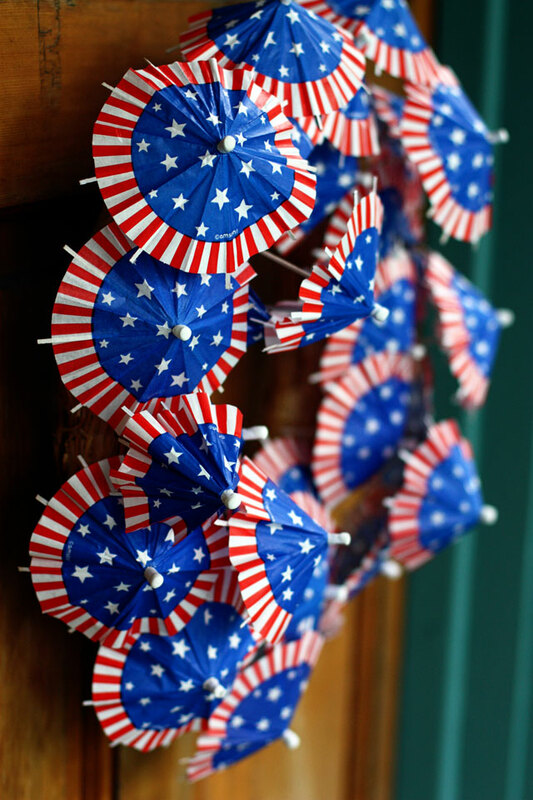 Tiny, precious flag umbrellas. To put in your tiny, precious, utterly delicious, mixed rum and patriotism cocktail. I don’t know about you, but I like stuff with flags that are not official flags. Real flags make me nervous. 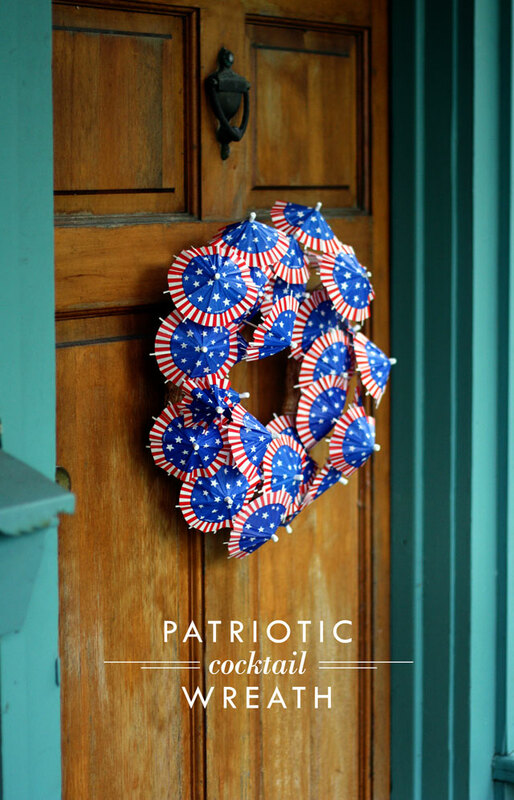 I grew up in one of that one house in the neighborhood that never flew the flag on holidays. Ever. Not because we were anti-patriots but because my dad thought they were too high maintenance and “Having a flag is like having a dog.” …Bah-yankeedoodle-humbug. He was one of those Boy Scout types who grew up with major flag rules; the flag needed to be taken out in the morning and in at night, taken down in rain or in bad weather, or hung at half-staff out of respect of the fallen….not to mention burning it if it touched the ground or became damaged in any way…not to mention folding it in seven perfect triangles. Drove him up the wall to see neighbors flying it 24/7 year-round. One time, when one of them let their flag get so tattered, we staged a midnight raid, stole it, and burned it in can in the garage with the door shut. The heat above the flame got so hot it melted the plastic casing on the garage door opener thingy and we could never get in to replace the batteries after that. So we parked outside. For years. In the name of patriotism. I’ll bet all this fuss about flag etiquette must seem weird to people reading this post in other countries. I forget that other countries have other rules until I watch the Olympics….before you know it, some hunky swimmer from Argentina gets up on the podium wearing his flag as a loin cloth…and nobody flinches but us. Way to be uptight, America. So. Flags or no flags, you should look into this. Be sure to check out Camilla’s original post. Also, here’s a tip for next time you need a wreath base – check your local thrift store. Thrift stores always have wreaths for a buck or two. So what if you have to yank off some old scragle flowers from 1983? Do it for your country! PS: I found my umbrella picks at my local Party City store in the Fourth of July section, $1.99 for 24 (they don’t appear to sell it online or I would provide a link here). 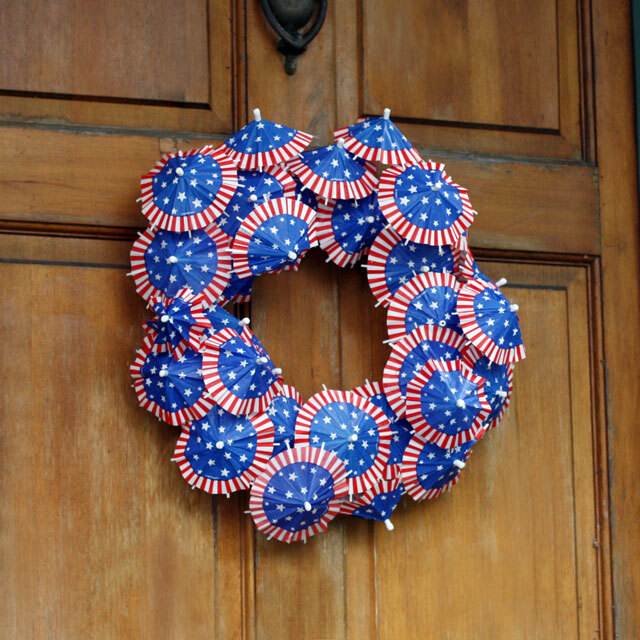 If you have a hard time finding umbrellas, this wreath made with flag toothpicks is pretty darn awesome too. I cannot find the words to express how much I love this!!! And I’ve admired the original post before. Now I’ve got to find some paper umbrellas. Like yesterday. Thanks Emily! I got mine at Party City. Pack of 24 for $1.99. Hope you get yours soon! You are lurking, aren’t you? I was looking at my spring wreath, the one with the tulips, daffodils and crocus on it that currently hangs on the front door and I said, out loud, mainly to the cats who we know are taking all this down and keeping little notebooks on my inanities with which to blackmail me at some future date, “I really need a new wreath but I do not want to pay $24.95 on sale for something.” You ride in to the rescue. The dollar store is next to Hallmark and I need a get well card. So don’t think this is creepy, but I love you! We totally should hang out over cocktails and compare our mental notes on life. We have such the same humor and outlook on life and I so tired of everyone around me looking at me as if I’m insane. So how does next Thursday work for you? Happy hour at Trader Vics? So thrifty!! Love it! Oh can I go with you and Anonymous to Trader Vics too please? Obviously. You are always invited! So cute! 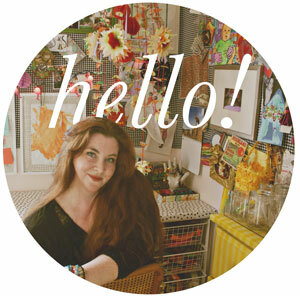 I’m definitely going to be buying mini umbrellas next time I see them to make this wreath. Adorable! And what a great redo of the original. I don’t really “do” flags either, and usually stick to just the red/white/blue color scheme when and if I ever decorate for July 4. This is inspiration indeed! Thanks as always, AP! This is too cute! I am so making this for my friend’s mom. She is such a wreath-aholic. Love your blog always. Thanks Aunt P! Party at Trader Vic’s!! Yay!! This craft is adorable! And so easy too. I added this to a recent roundup of dollar store July 4th ideas 🙂 http://www.samplememore.com/10-awesome-july-4th-items-from-the-dollar-store/ Thank you so much for sharing!